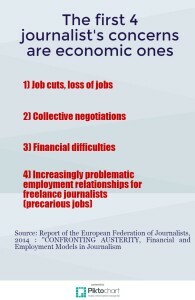 European media outlets have struggled to face the economic crisis that strikes the continent since 2008. But as revenues shrank in the recent years, so did press freedom. From 2007 to 2014 all EU countries, except Sweden, The Netherlands and Romania, have registered a decline in their media freedom level, according to data from Freedom House. 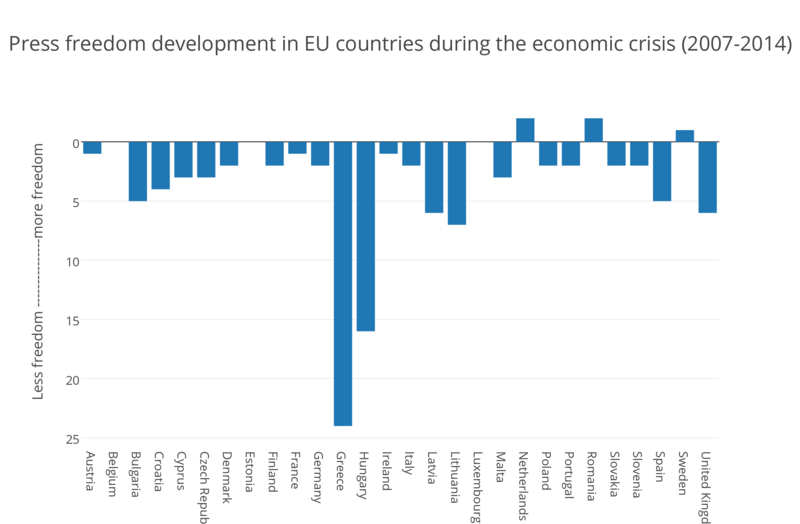 Although many factors had an impact in this worsening trend, it is revealing that those countries hit harder by the economic crisis suffered also some of the biggest falls in media freedom, being Greece a paradigmatic and worrying example. Data from Freedom House ratings, which attributes a total press freedom score to each country, from 0 (best) to 100 (worst). “As governments and media sectors felt the impact of the economic crisis that began in 2008, the state-run and private media suffered staff and salary cuts, declines in advertising revenue, and even the closure of outlets”, explained Jennifer Dunham director of research for Freedom of the Press at Freedom House. “This in turn had the effect of exacerbating existing problems, such as declining print circulation, the concentration of media ownership, decreasing print media diversity, and expanding influence on content by political or business interests”, she added on an essay published in their website. In this report we have looked at the specific elements of this weak economical environment that have contributed to harness media freedom in Europe, but also at the innovations that, conceived to deal with financial straits, may bring some hope to this deteriorated scenario. The European Union is well-known for being a place where fundamental rights are well protected, but is the picture now detached from reality? It seems so. The European Union wants to be an example of media independence for the whole world, but the situation has been deteriorating lately. 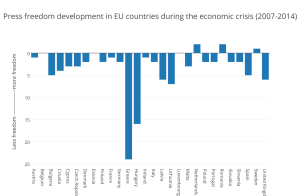 The economic crisis that bust in 2008 affected also the media industry in Europe, with different heaviness according to the individual national situation. The main problem is that economic independence and self-sustainability is the basis for media and press freedom. Media freedom itself is an indicator of the level of democracy of a country. As a general trend, during the crisis media experienced strong income declines and a drop in advertising revenues. Between 2007 and 2013, ad-spends fell in the countries more hit by the crisis: 28% in Italy, 41% in Ireland, 43% in Portugal, 47% in Spain and 62% in Greece. The decline was more moderated in other countries, just by 2% in France and by 3% in Germany, according to ZenithOptimedia. Moreover, print media faced a dramatic fall in the selling. However, the reasons behind it could be more than one, as Andrea Bonanni lights up, correspondent in Bruxelles for the Italian newspaper La Repubblica: “I am not sure whether it is due to the crisis only or rather it is because some models of print reporting are no more as attractive as before for younger people because they use new medias. It’s a difficult interpretation to do”. The economic difficulties led to cuts in staff and salary or pre-retirement, both in private and state-run media, and even to the closing of media outlets. The media with financial difficulties had many problems to continue in the business. Therefore, some of them have disappeared while some others had to reinvented and look for new sources of funding. 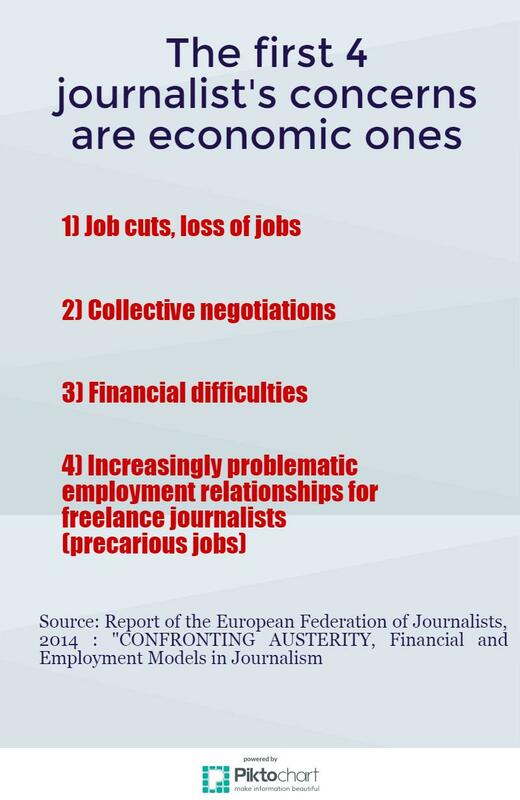 For example, in Spain, one of the countries most affected by the economic crisis, the Madrid Press Association found that between 2008 and 2014, 364 media outlets closed, and 11,875 journalists lost their jobs, with nearly 2,400 laid off in 2014. During that period there was also a process of media concentration because some outlets merged to face their economic problems. Thus, in 2014, 70% of the private TV networks in the country were controlled by only two corporations, Mediaset and Atresmedia. Latvia is another striking example of media ownership concentration. According to the report Freedom of the Press 2015, ownership in the media in that country is owned by a small number of corporations, mainly foreign companies. For example, the Estonian company Eesti Meedia owns two popular news sites: Apollo.lv and Tvnet.lv. The Swedish group Modern Times Group (MTG) also owns two TV stations (TV3 and LNT) and in 2012 the three major Russian-language newspapers merged into a single one. The shutdown and concentration of media have led to a reduction of pluralism. The supply of information has been reduced in these countries, so fewer voices can be heard by the public. Instead of shutting down or merged, some other media outlets have looked for new funding sources, recurring to state subsidies or partnerships with private companies. This “complicated partnerships”, as the project director at Freedom House Vytis Jurkonis define them, are also a problem for press freedom. 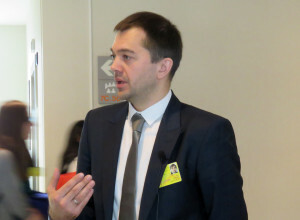 Vytis Jurkonis, project director at Freedom House. The report Confronting Austerity published by the European Federation of Journalists found that there is a wide range of media financed by state subsidies. The subsidies take different forms in different countries, but all of them “may hinder the independency of media”. Media receiving money for the government are less willing to criticize it because they might lost the financial aid. A similar situation occurs with those media outlets that decided to partner with private companies or corporations. “If you are getting related to some business companies which might have also a political agenda, of course you could become self-censored or less impartial”, Jurkonis explains. The Spanish freelance journalist Ekaitz Cancela shares the same worry. “The big banks got the debts of the newspapers and if you have to pay to a bank to publish a story you can’t be critic with them” he argues. Listen to Vytis Jurkonis, project director at Freedom House. Listen to Jean Paul Marthoz, senior adviser at the Committee to Protect Journalist. Experts confirm the deteriorated economic situation for professional journalists. Elsa González, president of the Spanish Federation of Press Associations stated in an interview with EYMD: “The loss of job positions generates a huge weakness in the journalists, which apply self-censorship and do whatever is necessary to keep their job positions. The salaries are also lower, so media outlets are hiring recently graduated and inexperienced journalists, which reduces the quality of the information. Meanwhile, lot of seasoned journalists with experience and good agendas are leaving the newsrooms because they are more costly for the company. Therefore, there is not a chain of knowledge, politicians take advantage of the journalistic weakness and the quality of democracy falls”. Andrea Bonanni, also interviewed by EYMD, adds: “All the journalists have been affected in the sense that there have been pre-pensioning of journalists that had higher salary; younger journalists are affected by the fact that they are underpaid.” He continues: “The financial and economic independence of journalists is inherent to the freedom of the press. If a journalist is badly paid, he will be more dependent on his employer than a well paid journalist, but it is an indirect consequence, not a direct one”. “In general, there is a principle: in free society with free press, the media independence depends very much on self-sustain of the press. 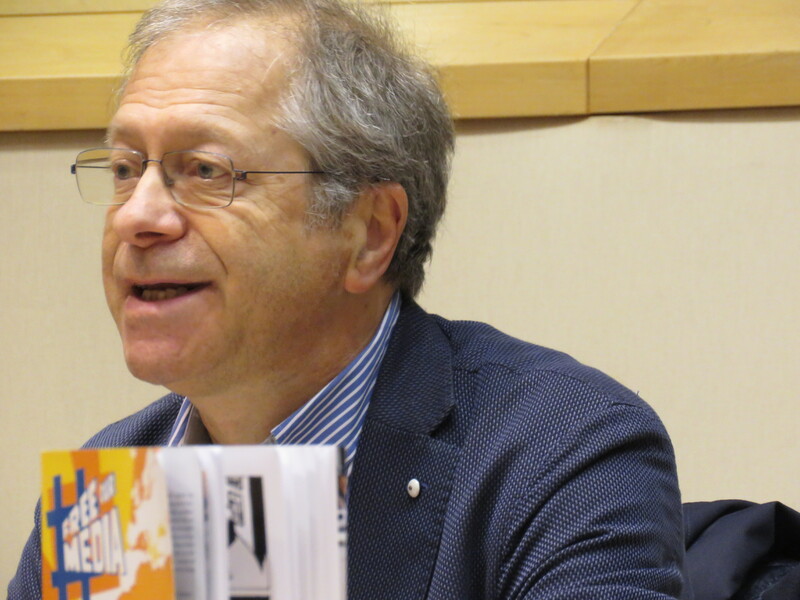 If the press is not able to earn money selling newspapers and news, then we have a problem, it has a heavy incidence on the independence of the press, for example from the political power”, Andrea Bonanni remarks. The lack of traditional funding has forced media to look for innovative ways of financing themselves. Paywalls or paying for content is the most common, according to a survey conducted among European Associations of Journalist. Endowment, donations and crowdfunding have also gain popularity especially among new media and to fund specific projects. While endowment and donations pose the traditional concerns about external pressure on editorial teams, crowdfunding and paywalls raises some cautious hopes for improvement in terms of independence. Indeed, media using this funding tools tend to present this freedom grant to their potential audience as the main reason to invest in them. 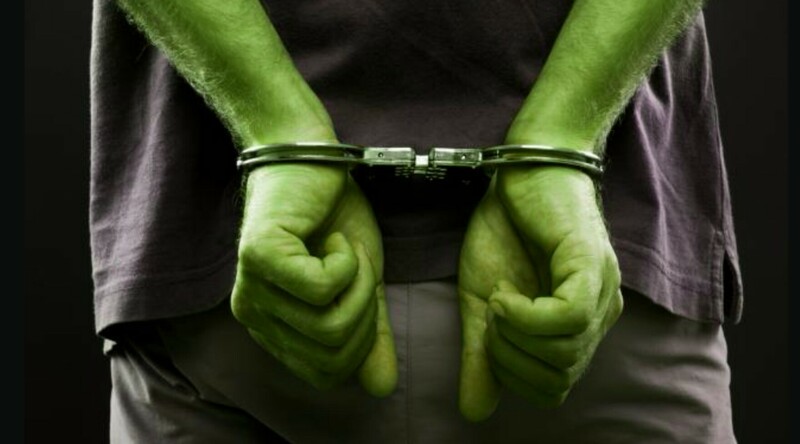 “EL ESPAÑOL (link to: http://www.elespanol.com) will only be able to accomplish its mission, fighting the bad and enhancing the good, if it keeps its independence. That means, being financially independent in a reasonable period of time trough a mixed model including advertising and subscriptions”, explained Pedro J. Ramírez, former editor in chief of the Spanish leading newspaper El Mundo. 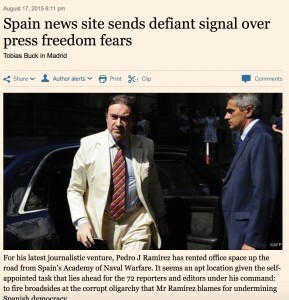 Ramírez was fired from El Mundo, newspaper he founded, after publishing information that harmed the Spanish government. He decided then to create its own online newspaper, launching a crowdfunding campaign. He raised 3.6 million euros, beating a record for a crowdfunding project in Spain. The Correspondent, in The Netherlands also recorded some of the highest sums in the short history of crowdfunding, raising 1.3 million euros, according to crowfdundingworld, a site specialized in t his kind of initiatives. They define themselves as an “online journalism platform that focuses on background, analysis, investigative reporting, and the kinds of stories that tend to escape the radar of the mainstream media” that nowadays have 37.000 subscribers. Escaping the mainstream media and providing quality content is one of the main goals of this kind of media and, at the same time, the biggest opportunity for enhanced independence. “If there is a number of a highly professional or maverick independent critical or even radical news organizations going where the others do not go, necessarily it changes the parameters, it forces the mainstream media to not forget some issues at the end of the day”, Jean Paul Marthoz, senior advisor at the Committee to Protect Journalist, argues in an interview with EYMD team. Across Europe a number of these high-quality journalism initiatives are succeeding. It is the case for the Dutch start-up Blendle, which sells individual articles with additional feature supported by social media, or the Danish Singler, also mentioned in a recent study by expert Andreas Bittner in the report Confronting Austerity. However, it remains the question on whether this model would reach financial stability or would be finally limited to fund individual projects. “The business model will be hybrid (…) and the combination of different (funding) tools will generate independence. But until now, still none of them has stablished sufficiently as to allow to have investigative teams or a network of correspondents, and this is essential”, Elsa González, president of the Federation of Spanish Associations of Journalists, said. Marthoz agrees: “I do not think that we are going to see a big change in the media mamut that we have around. We will still have the big media groups. I see this new media much more as mosquitos battling elephants than mosquitos that will become a force so the elephant will disappear”, he said.